Pamper your gorgeous flooring the natural way—for pennies! 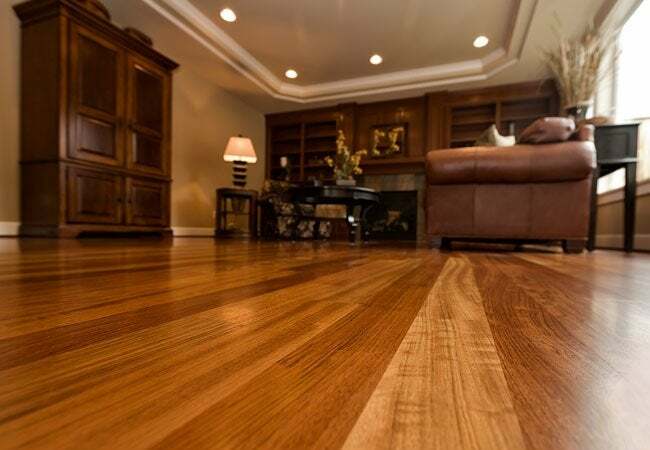 Wood floors add beauty and warmth to any home, but they do demand special care. Though there are plenty of commercial wood floor cleaners on the market, these can be pricey. Plus, if you have pets or kids, you may want to shy away from those with harsh chemicals. So why not mix up and use a homemade wood floor cleaner that will cost far less and skip toxins altogether? Whip some up and use these techniques as part of your regular cleaning routine, and your wood floors will look wonderful for years. Add two to three drops of pure castile soap (like Dr. Bronner’s) to a large spray bottle and fill it the rest of the way with warm water. A little castile soap goes a long way, so a 16-ounce bottle ensures that you’ll dilute it properly; plus, with a batch this size, you’ll have enough made to clean your floors several times. If you’d like your homemade wood floor cleaner to impart a fresh scent on the space, add three to five drops of such essential oil as orange, peppermint, lavender, or lemongrass. Then close the bottle and shake vigorously to mix the solution. Before breaking out the homemade wood floor cleaner, remove surface dirt. Attach a fringed pad to a microfiber mop. The fringe will trap large debris and push it ahead of the mop, keeping particles from getting under the pad where they could scratch the floor, while microfiber pad traps dust. Run the mop around the baseboards of the room without lifting it up. Lifting the mop up could allow larger particles to get trapped underneath the pad—again, potentially scratching the wood. Then, go back and forth across the room, without lifting the mop, slightly overlapping each stroke. Using the hose and baseboard attachment, vacuum the perimeter of the room to remove any dirt that remains trapped around the baseboards. Carefully move any furniture necessary so that you can access the entire wood floor. For large pieces, like sofas, fold up some old towels and place them underneath the legs so you can slide them without scratching the floor. Swap the fringed pad for a cleaning pad designated for wet use onto the mop and shake the cleaning mixture well. 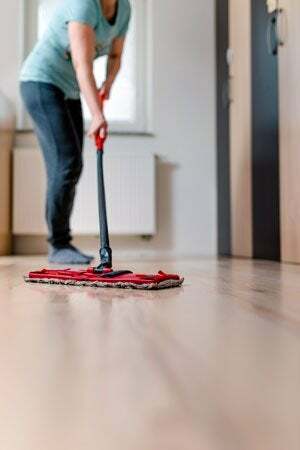 Starting at a corner of the room and moving towards the exit (so you don’t walk over areas you’ve already cleaned), lightly mist a small area of the floor with cleaning solution. Then, working in the direction of the wood grain, mop the area until dry. It crucial that no moisture remains on the floor—a wet wood floor left wet can easily cup, warp, and split. Continue working in small sections until the entire floor is done. Don’t stop there! The formula for this homemade wood floor cleaner is also great for cleaning a host of other household surfaces. It isn’t strong enough to disinfect but will certainly spiff up countertops, enamel appliances, and tile surfaces on a daily basis.